It is essential to use gas sensors for air quality monitoring and leakage alerts in everyday life. Besides sensing, smart gas sensors capable of performing signal processing and communication have attracted a lot of attention. Additionally, incorporating these functions into a single chip results in economical and tiny smart gas-sensing systems. For semiconductor gas sensors, which are the most extensively used gas sensors, a sensor material has to be heated to several hundreds of degree Celsius. So to combine these gas sensors with electronic circuits, a micro-hotplate (MHP), which is a MEMS-based heating structure, is needed to thermally separate the sensor and the circuits. The MHP is commonly mechanically unstable, and a tradeoff exists between the thermal isolation property and mechanical stability. A research team at the Department of Electrical and Electronic Information Engineering at Toyohashi University of Technology recently suggested the use of SU-8 as a supporting material for the MHP with the intention of improving the mechanical stability, while guaranteeing the thermal isolation property. Additionally, SU-8 is a polymer material that is extensively used for microelectromechanical systems (MEMS) and has low thermal conductivity and superior mechanical stability. The researchers fabricated the MHP and examined its heating attributes. By using a thick polymer film, it is possible to realize both the mechanical stability and high thermal isolation property. Furthermore, although we have to evaluate the mechanical stability, this device is promising for smart gas sensors. "Mechanical stability is one of the major concerns for fabricating an MHP. Using a polymer material for such microhotplates seems to be an eccentric approach, but surprisingly, it went well. Moreover, this device will boost our study to develop multimodal sensors, which are multifunctional integrated sensors including gas sensors," said Professor Kazuaki Sawada. The fabricated MHP comprises of a heating membrane with an area measuring 140 μm × 140 μm, and a 33-μm-thick SU-8 layer placed on its bridges. 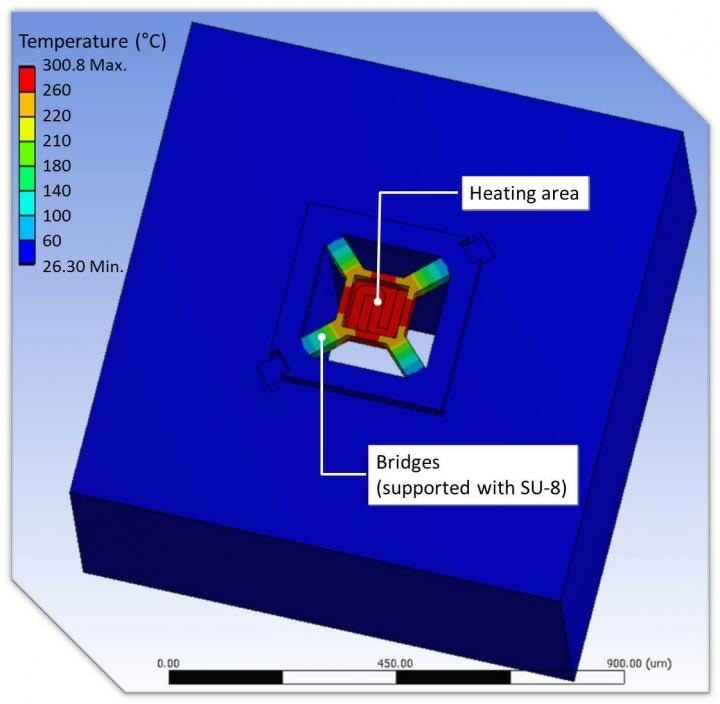 The simulation established that the MHP exhibited superior thermal isolation properties. It was observed that the MHP temperature reached 550 °C at 5V. Furthermore, the MHP’s power consumption approximately corresponded to 13.9 mW for heating to 300 °C, which is comparable with the power consumption published in the earlier studies. Also, a consistent operation under a constant voltage was noticed for 100 minutes. As a result of the thick SU-8 layer, the MHP does not need the stringent control of the stress that occurs within the membrane during the fabrication process. This feature, along with the superior thermal isolation property, enables the chip’s flexible layout design, and thus, the MHP is advantageous to a tiny smart gas sensor chip. Going forward, the researchers will advance their study to attain such smart gas sensors.